which I had to pull off in three days. Cue the stunt sewing music! Knowing that I had three sewing days to complete a wearable version (interrupted by a weekend of grandchildren invading our home like Cossacks), and that the skirt had to be widened by a whopping eight inches, I had to choose a forgiving fabric that didn’t need lining. Tucked in my stash were two yards of high-quality stable knit ponte in aubergine (from Eileen Fisher) that fit the bill. Since I spent my 20s sewing Diane Von Furstenberg knock-offs out of a slippery knit called “Quiana” on a straight-stitch Singer 15-91, I have no fear of knits. 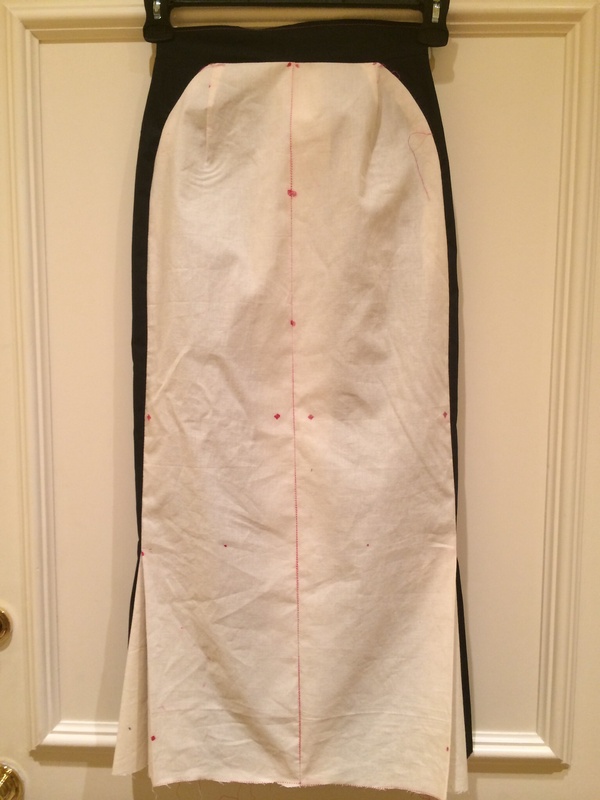 I basically chopped the center front and two parts of the back of the muslin open lengthwise, stuck in swaths measuring a total of 8″ straight up and down in both, fitted it quickly and got ready for the “Hail Mary” pass. (For those of you visiting from other cultures, the “Hail Mary” is any last minute desperate play a losing sports team will use to try to win a game in the final seconds.) Rah rah rah! 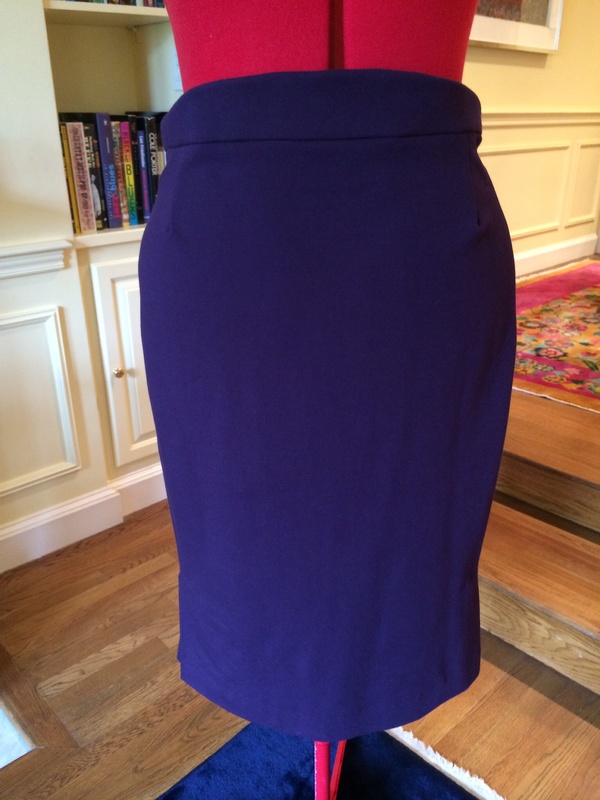 Two yards of wide ponte should work for a pencil skirt, right? Er, not when the pattern has odd protrusions and three kick pleats. So I quickly took up the pattern by about 4″ in length and as you can see, it just squeaked by. This particular ponte has excellent stretch and recovery, so I was reasonably sure that I wouldn’t need a zipper. But the waistband has an elegant yet tricky shape that arcs up in the front and dips down toward the back, which is critical to the design. I was stumped as to how I could reinforce it enough to hold the shape while having it be stretchy enough to get over my head. Friends, this is the kind of thing that keeps me up nights. When time came to make the waistband, I rooted through my bag ‘o interfacing looking for that knit fusible I thought I might have (desperate times call for desperate measures), and spotted a yard of corset mesh stashed away. Corset mesh is like bathing suit liner meets Spanx on steroids. It’s constructed like mesh, so it’s breathable, but it’s stiff as granny’s girdle. Apparently the designer Roland Mouret used a similar fabric, power mesh, to line his famous “Galaxy” dresses of a few years ago. so I think I ordered both power mesh and corset mesh (which is stiffer, and I need all the help I can get), and that’s how the stuff got buried in my stash. You can find here: (Corset mesh from EmmaOneSock.com), and they have power mesh as well. I carefully cut the corset mesh and sewed it into the exterior pieces of the waistband. 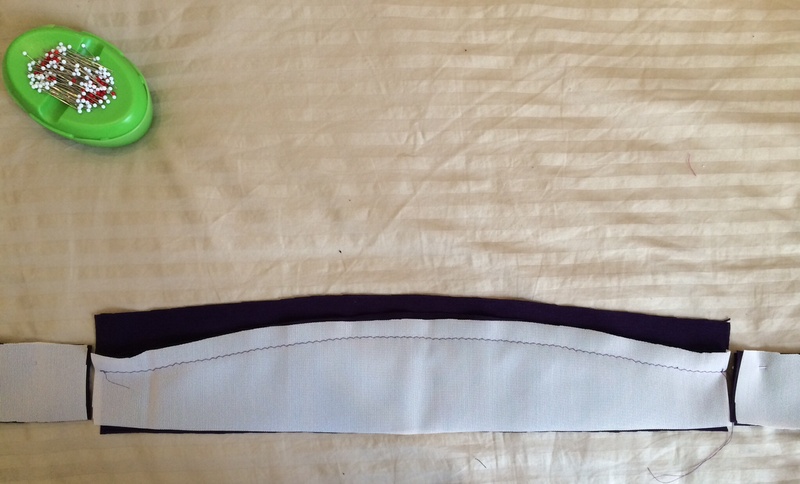 Then I drew the curved seamline of the waistband onto the pieces and, barely breathing, sewed the exterior pieces to the lining along the curve, which starts down, arcs up, gets flat, and arcs back down again. 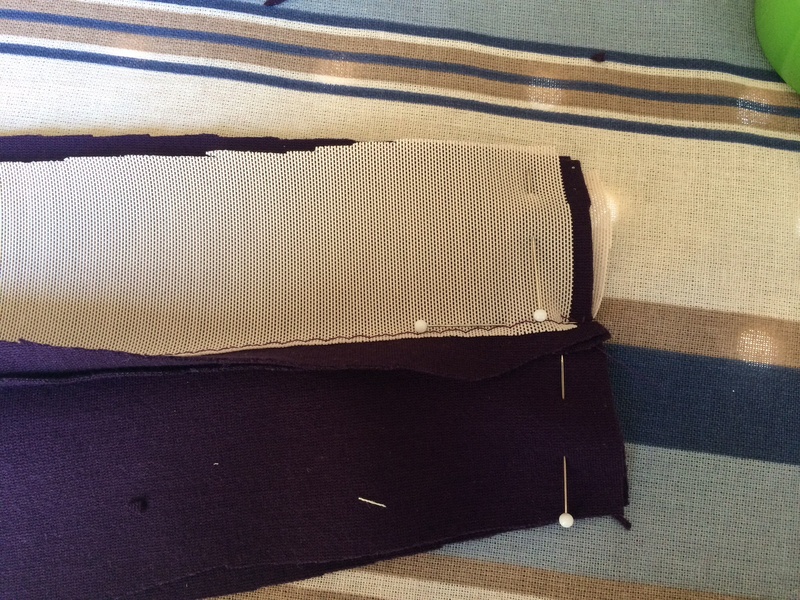 I attached the waistband front piece to the back piece, anxiously lining up the seamlines. I trimmed the corset mesh and seams, then got the waistband aligned and sewed onto the body of the skirt. 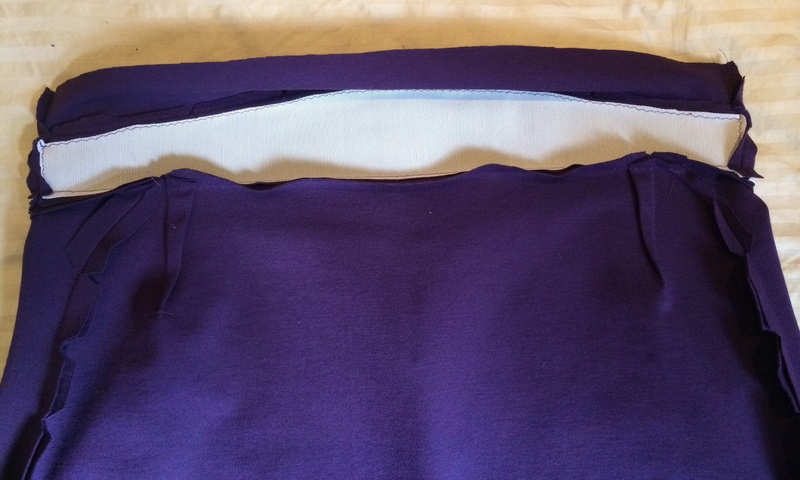 I flipped the whole thing over, pressed the lining inside, and lacking time to hand-sew the lining down, took a deep breath and “stitched in the ditch” (top-stitched right on the seamline) where the waistband met the skirt body. That corset mesh holds the waistband up and holds me in, and now I want to put it in everything I own. There are three kick pleats (two on the side and one in the back) and rather than lining them with the ponte, I decided to use a vintage wool challis from the 50s that I bought in the third floor vintage fabric room at International Silk and Woolens in Los Angeles. I’m using the rest of the fabric to make a top to go with the skirt. I’m busting so much of my stash this month! 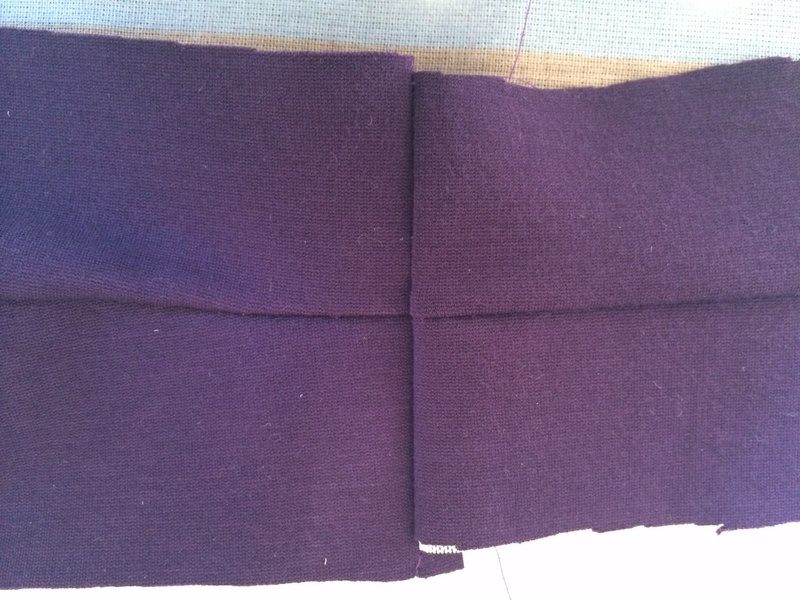 Following the original pattern directions from the 50s, I folded back the “pleat” part of the main skirt pieces and attached the lining rectangle to the two sides. Then I catch-stitched the whole thing to the skirt itself at the top. Phew, just enough time to give the skirt a blind hem and pack for New York! And you know the rest. I’m not participating officially, because my projects come along so slowly that most days I’d be running around in a Chanel jacket and my underwear if I had to wear my “makes” for a month. 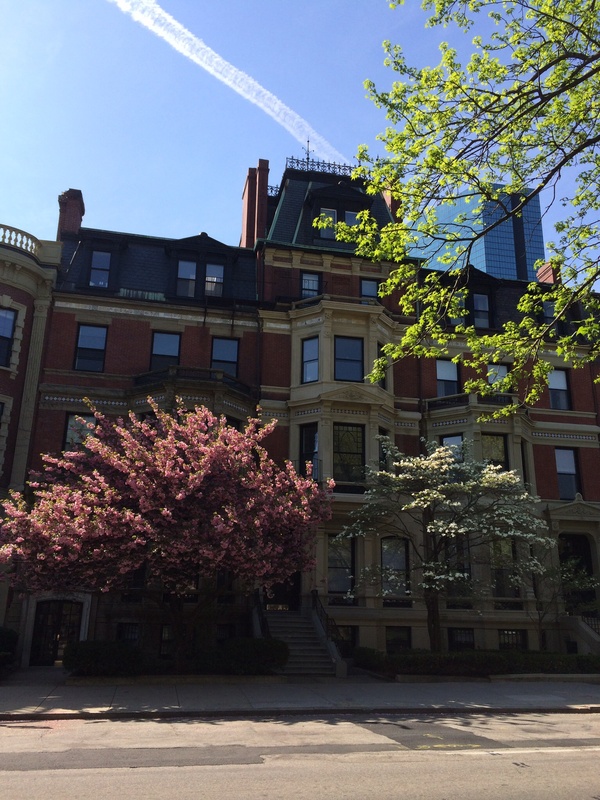 But spring has bust out so beautifully I thought I’d share some photos from around the neighborhood in Boston. 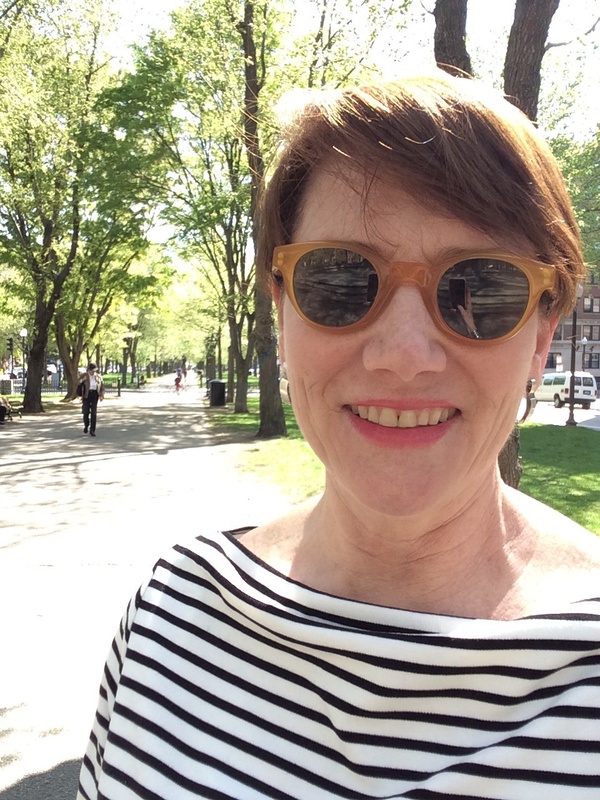 Most were taken one morning after I met a friend for coffee on Newbury Street, wearing a version of the crushed boatneck frankenpattern top I wrote about here (when I also attempted to knock off a matching Chanel 2.55 bag). This is the long “mall” of walkways, statues and trees that goes between the two sides of my street, Commonwealth Ave., for about a mile. This part of town is called the Back Bay, because the bay it was built over was filled in and developed in the mid-1800s. 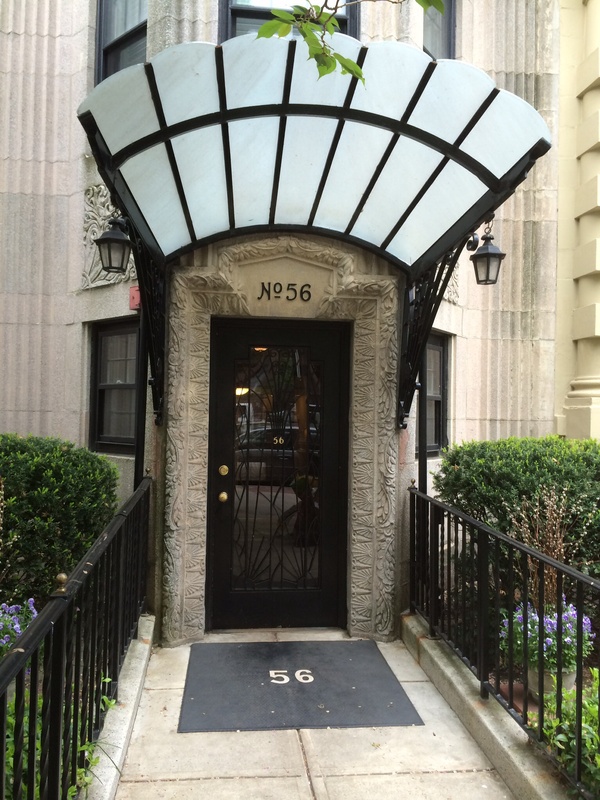 A number of the wealthy Bostonians who moved in had been on what was called “The Grand Tour” of Europe, so the area was developed to look like France. 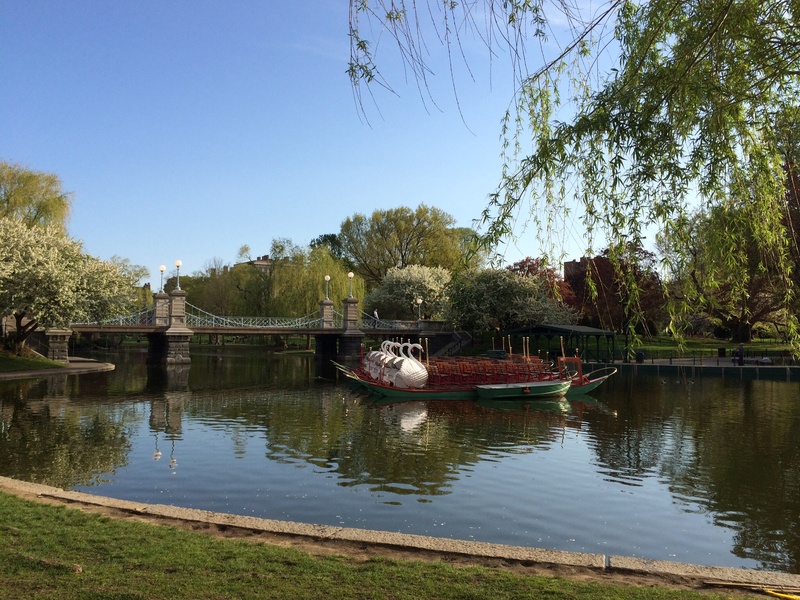 At the beginning of Commonwealth Ave. is Boston’s famous park “The Public Garden” which is always well-kept and beautiful, but particularly in spring. In the warmer months, the famous Swan Boats are pedaled like bicycles around the pond, just as they were in the much-loved 1940s children’s book “Make Way for Ducklings.” If you walk through the Public Garden on a warm Saturday, you often see two or three wedding parties having their photos taken. One day my son and I encountered an unusual wedding party there, where the groomsmen were hanging back cooling their heels, the bridesmaids were hovering around in a concerned tizzy, while the bride was lying prone on her back on a bench, clutching her bouquet on her chest, and bawling her eyes out in what appeared to be a full-on anxiety attack. There’s so much pressure put on brides in U.S. culture now to be skinny and be the star of the show, I figure she hadn’t eaten in weeks. I’ve often wondered what happened to that marriage. 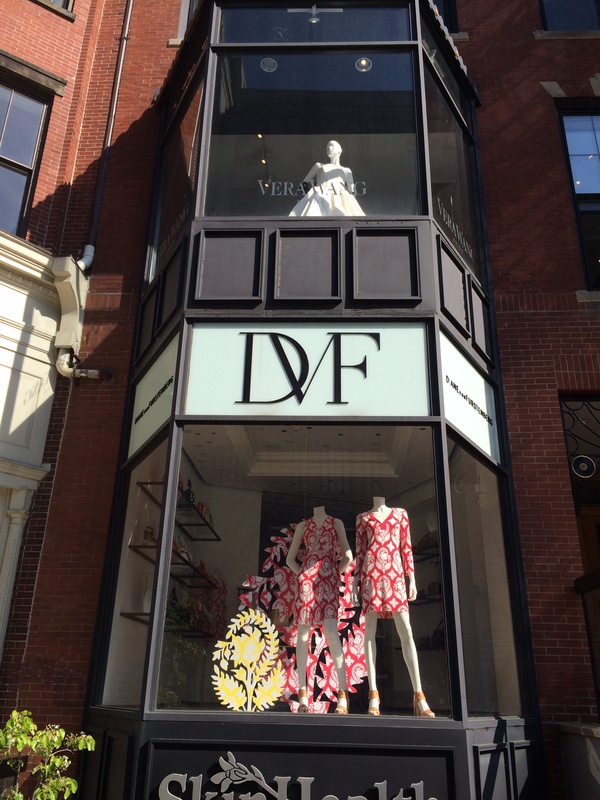 Around the corner is Newbury St., where you can get your Chanel on. It’s fun for window-shopping or grabbing a bite. 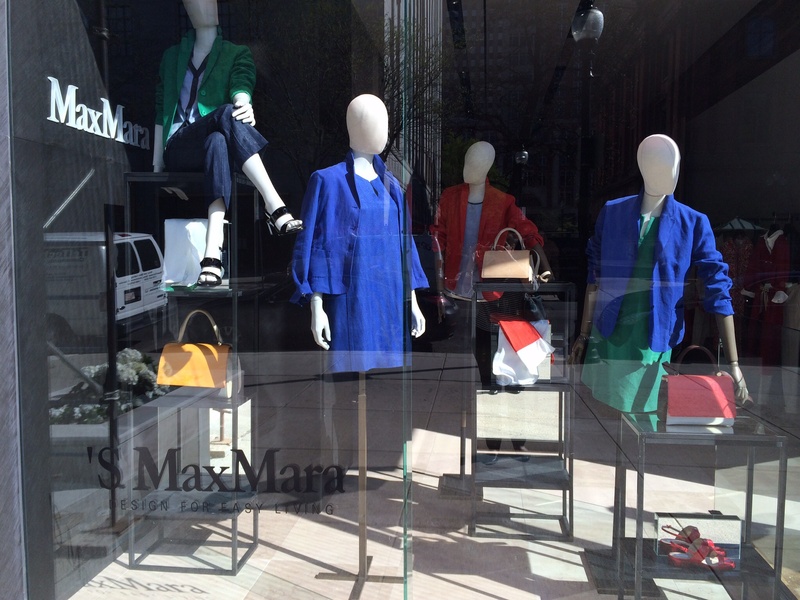 I like those candy-colored linens and bags in the Max Mara window. I my next life I’m going to be an Italian contessa and dress like that 24/7. 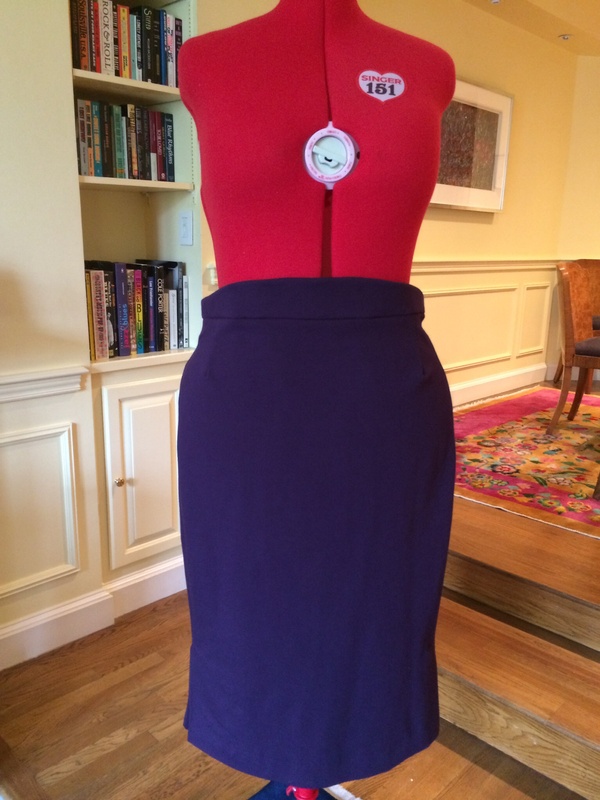 I have been celebrating “Me-Made-My” by stitching up some things to wear with the Charles James skirt, including a Claire McCardell shrug that I’ll share next time. I hope your sewing is going well, too! 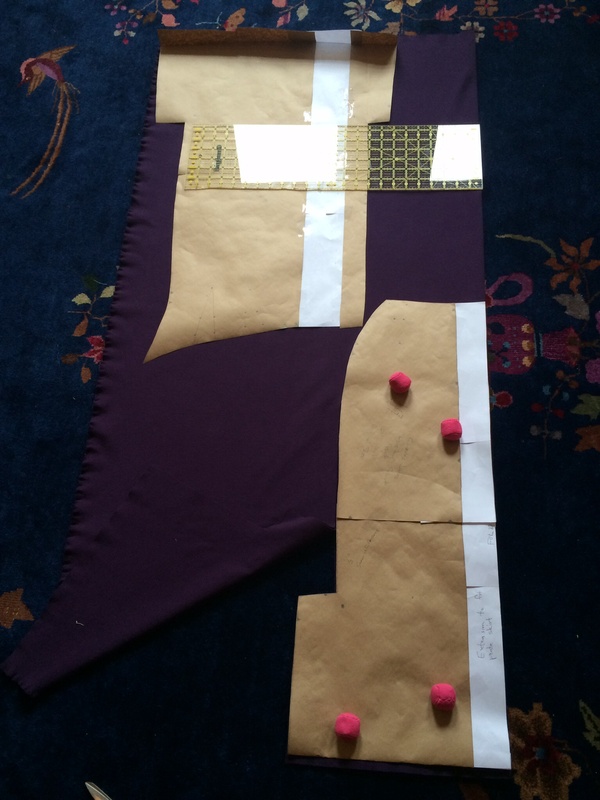 This entry was posted in Charles James Skirt, Working with Vintage Patterns and tagged Charles James sewing pattern, Power mesh, Sewing with Ponte, Sewing with Power Mesh. Bookmark the permalink. Ooh, gotta get me some power net! Love the skirt. I’m not a skirt person, but yours makes me want to have one! I just realized that I had a middle-aged moment when I wrote this, and that I actually used “corset mesh” to hold up the waistband. You can find corset mesh at Emma One Sock here: http://emmaonesock.com/fabrics/Backinstock.asp?lcd=118831 It’s stiffer than power mesh, which is more like the kind of liner you’d find in a “Miracle Suit.” Emma One Sock also sells power mesh. 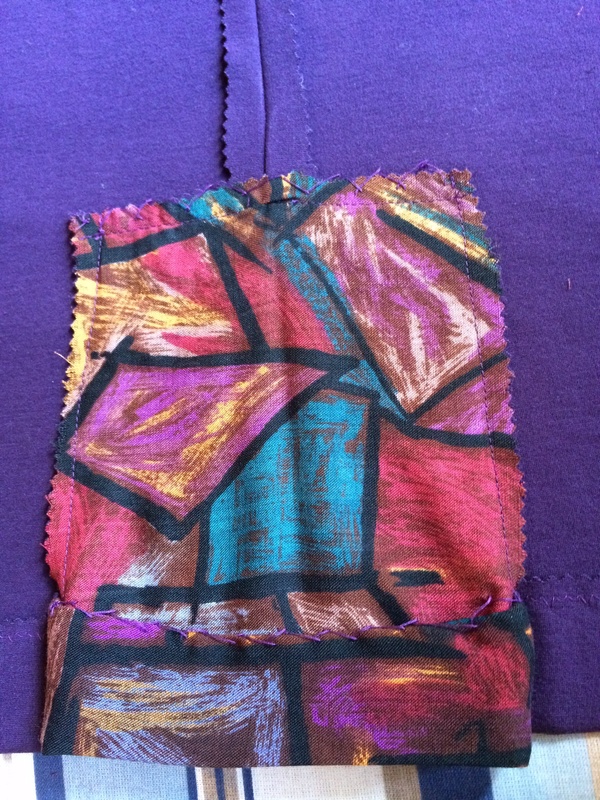 That was a real sewing adventure! It looks great, and I love the idea of the three kickpleats. 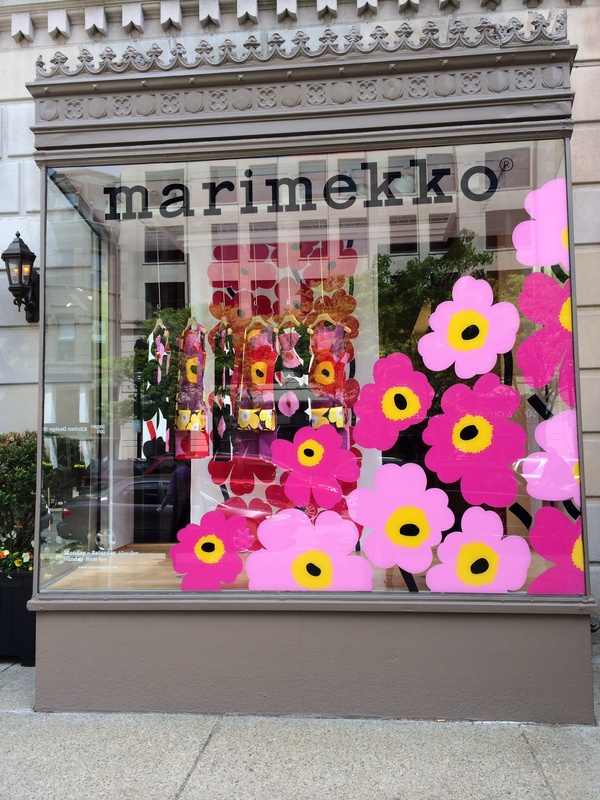 And that Marimekko window is pure fun. It was an adventure, come to think of it! Why do I think these projects will be easy? It always gives me new-found respect for each designer, though. 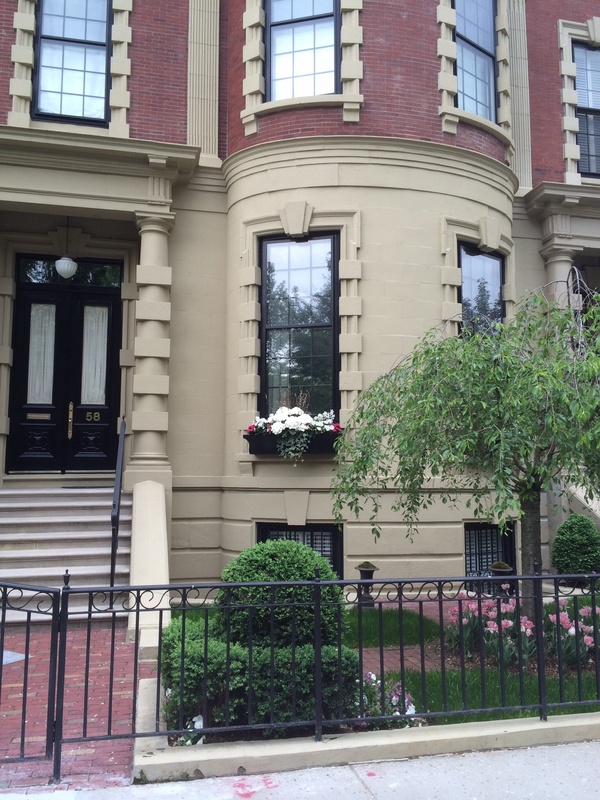 I did so enjoy your Boston walk; I enjoyed this post as much as the CJ museum tour..
I’m so happy to hear that! I always enjoy thinking up fun things to share with readers like you. O mighty fabric that keeps my waistbands up and keeps me in, where have you been hiding? Finding power mesh must be my number one priority! I love your idea of using a print for the kick pleats! 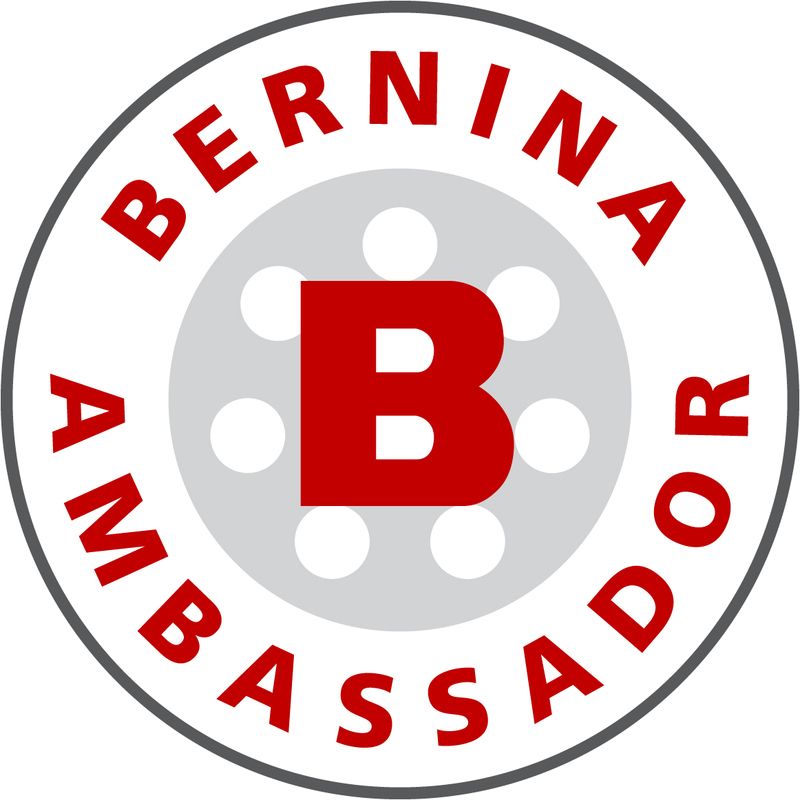 Fun read – good luck with the Italian contessa aspirations! Thanks! 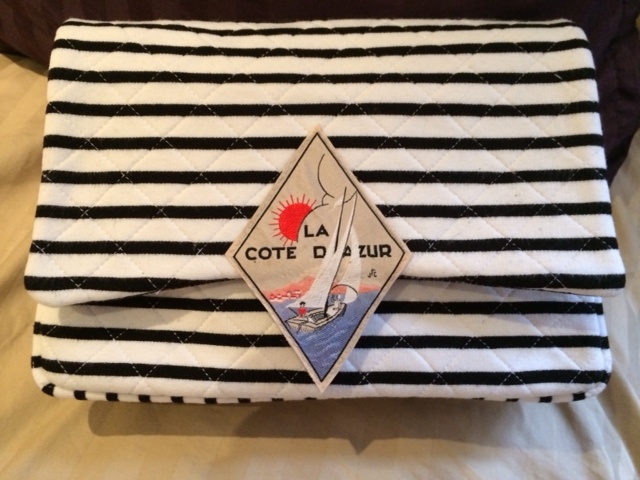 I love those Italian fabrics but you do need a laundress for daily use. So I’ll keep working on the contessa option. 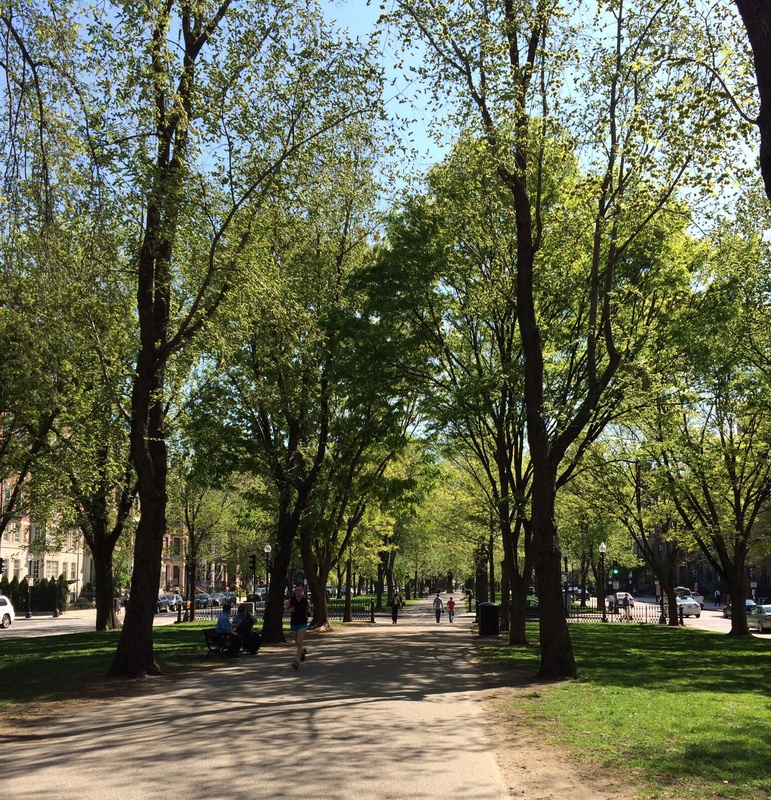 It always amazes me how quickly Boston gets green and beautiful in the spring! Thanks Carrie! I hope you’re enjoying spring on your side of town, with all of that wedding sewing you’re doing. Knit? No zip? You rebel! I did not see that one coming by a mile. My hat is very tipped to you. Well, as much as I’d like to go full vintage with a woven, underlining, lining and waist-cincher, at this age I have to sit down in the thing! 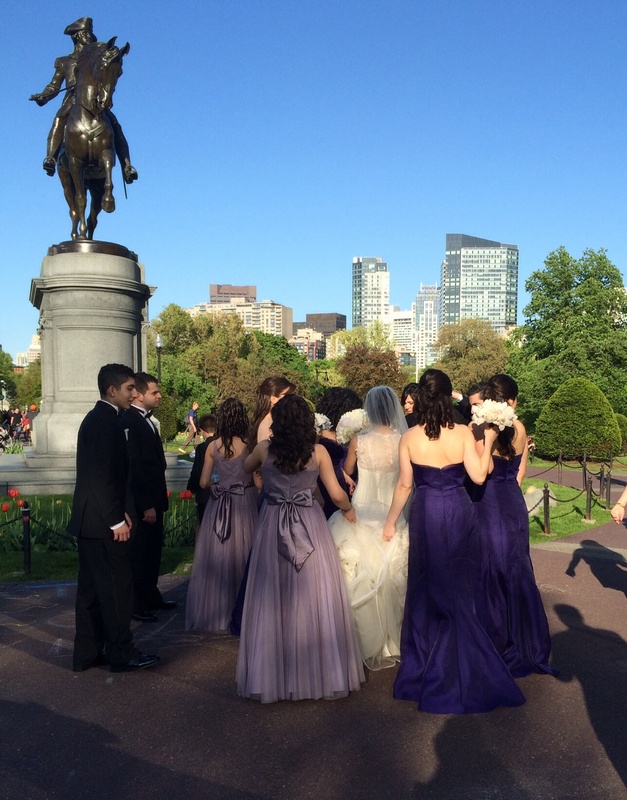 Wonderful walk through Boston. Your skirt looked wonderful and I never would have thought to use a knit and very creative use of power knit. Speaking of knits, your post on Merino wool jersey got me going on the stuff. I’ve ordered a few yards from NewZealand and it truly is amazing. Hi Mary, I know, isn’t that NZ merino a cut above? I haven’t had a chance to work with mine, though I did throw a swatch in the washer and dryer and it came perfectly. I’m putting all of my wool stash away until fall as the moths in the Vineyard would get it. Let me know if you have sewing tips for that kind of fabric! I’ve been slow in getting to read your post, Julie, but it’s a good one! 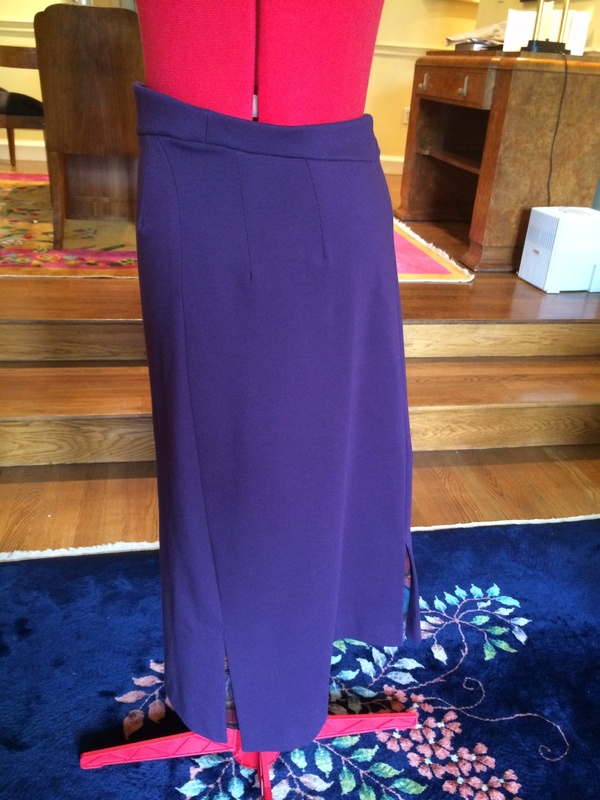 It’s so interesting to see how your skirt came together (thank heavens that your Hail Mary pass worked). And clearly I need to get down there and wander around Boston more often. 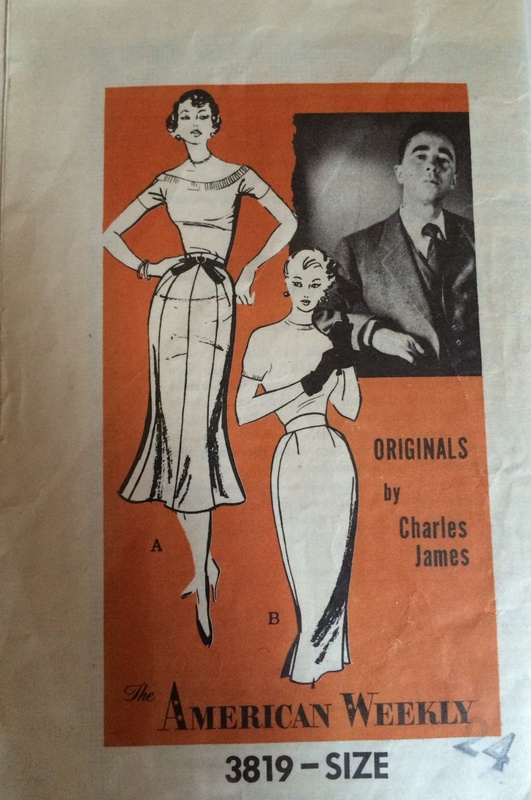 Wow, I had no idea that Charles James made sewing patterns! Even his photo on the envelop makes the pattern look hard. That’s hilarious, Lynn! He was quite a character. I think the sewing patterns came out when he was trying to brand out into ready-to-wear. Some day when I’m trolling eBay the other two patterns are going to come to light! Thank you for being part of the share-inStyle family. Nice to hear from you! Let me know if you get over to Boston. I’m always game for a meet-up! 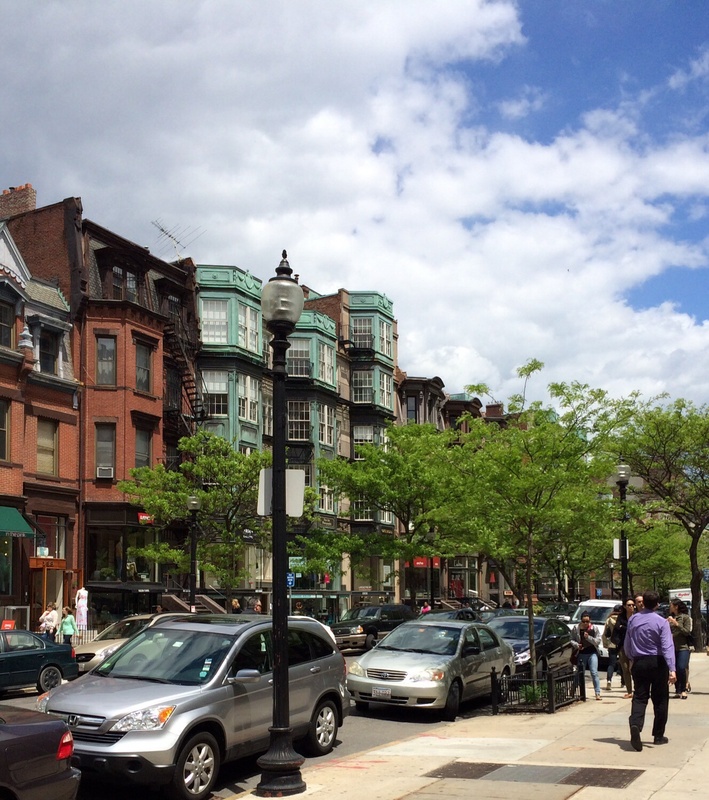 Love seeing this pretty area of Boston! What a fabulous skirt, such a fantastic pattern. Thanks so much! I’m in a beautiful part of the world, particularly in spring and fall.